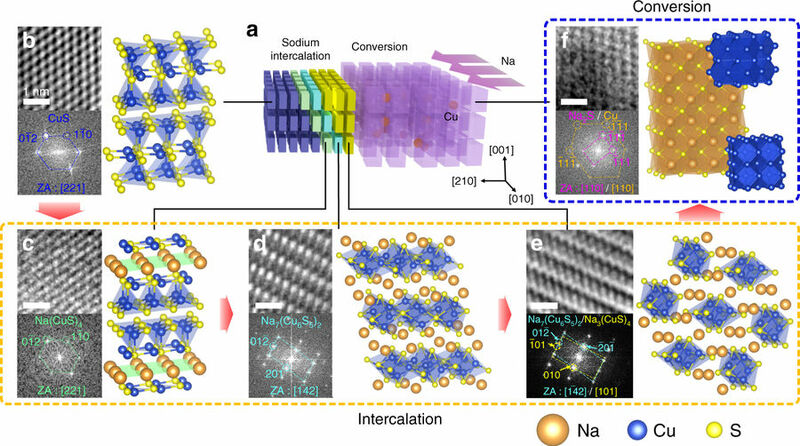 A KAIST research team recently developed sodium ion batteries using copper sulfide anode. This finding will contribute to advancing the commercialization of sodium ion batteries (SIBs) and reducing the production cost of any electronic products with batteries. Professor Jong Min Yuk and Emeritus Professor Jeong Yong Lee from Department of Materials Science and Engineering succeeded in developing a new anode material suitable for use in a SIB. Compared to the existing anode materials, the copper sulfide anode was measured to exhibit 1.5 times better cyclability with projected 40% reduction in cost. Batteries used in various applications including mobile phones are lithium ion batteries, mostly referred as Li-ion batteries or LIBs. Though they are popularly used until now, large-scale energy storage systems require much inexpensive and abundant materials. Hence, a SIB has attracted enormous attention for their advantage over a lithium counterpart. Further analysis presented in the study reveals that copper sulfide undergoes crystallographic tuning to make a room for sodium insertion. Results indicate that the sodium ion-insertion capacity of copper sulfide is as much as 1.5 times that of lithium ions for graphite. Furthermore, a battery with this new anode material retains 90% of its original capacity for 250 charge-discharge cycles. With the natural abundance of sodium in seawater, this development may contribute to reduction in battery costs, which can be translated into up to 30% cut in the price of various consumer electronics. Professor Lee expressed his hope for “the production of next-generation, high-performance sodium ion batteries”. Professor Yuk said, “These days, people are showing a great deal of interest in products related to renewable energy due to recent micro-dust issues ongoing in Korea. This study may help Korea get a head-start on renewable energy products”. This research, led by PhD candidate Jae Yeol Park and Dr. Sung Joo Kim, was published online in Nature Communications on March 2.